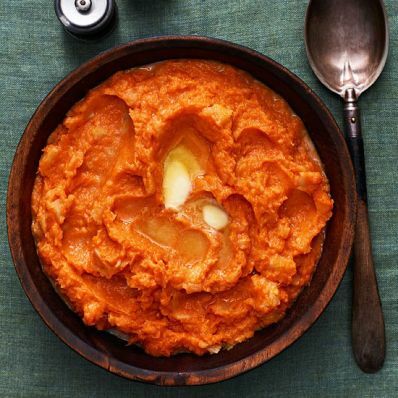 1 of 2 Combine parsnips and sweet potatoes in a medium pot; cover with 1 inch of cold water. Bring to a boil, then reduce heat to medium and simmer for 10 to 15 minutes, or until vegetables are tender and parsnips have lost their bitterness. 2 of 2 Drain cooked vegetables and immediately return to pot over low heat. Mash with milk, brown sugar, butter, salt and allspice. Per Serving: 324 mg sodium, 0 mg chol., 1 g sat. fat, 11 g Fat, total, 4 g fiber, 5 g pro., 22 g carb., 188 kcal cal.